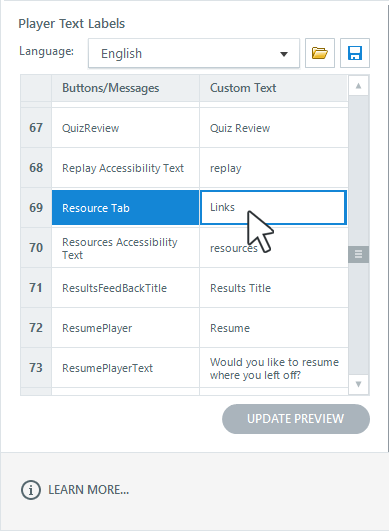 Articulate Storyline lets you customize the default text used for on-screen messages, screen reader instructions, buttons, and other controls on your course player. You can even switch to a completely different language. To customize your player's text labels, go to the Home tab on the ribbon and click Player. 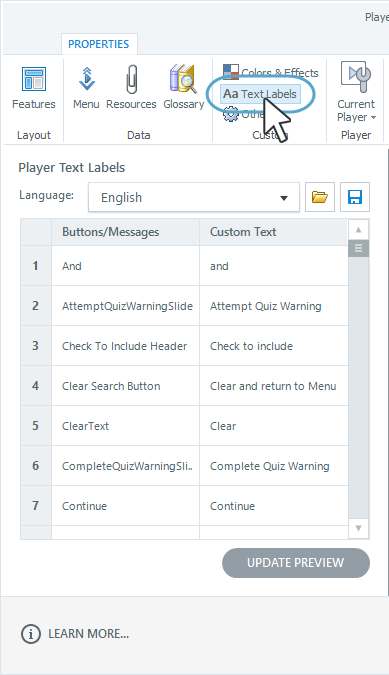 You can customize individual text labels, change all labels on your player to a different language, or switch to a previously saved set of text labels. On the left side of the window, Storyline displays a list of all the text labels you can edit. For any item that you want to change, just type your preferred text in the Custom Text column. To see your updated text labels in the preview area, click the Update Preview button at the bottom of the window. Click the Save button to the right of the Language selector. This saves your text labels in Storyline's default location, but you can choose a different location if you need to share them with other developers. However, if you choose a location other than the default, the saved text labels won't appear in the Language drop-down for other courses that you build. In that case, you'll need to use the Load button (the folder icon to the right of the Language drop-down) to locate the *.xml file and add it to your language library. 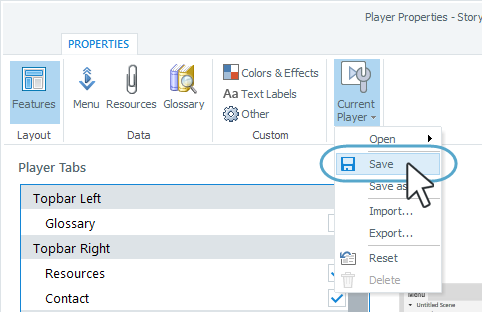 To switch to a completely different language or a set of custom text labels you previously saved, use the Language drop-down to choose a set of text labels. Custom labels appear at the top of the list, and more than two dozen built-in languages appear below that. If you saved a set of custom text labels and you're not seeing it in the list, you may have saved it in a location other than Storyline's default. No problem. Just click the Load button (the folder icon to the right of the Language drop-down) to browse for it. Accessibility Tip: The language you select here will be added to the meta data of the story.html file in your published output and used to identify the language of your course to screen readers.